Every parent has heard it. It’s bedtime and you want your little one to snuggle in, but instead she says, “I don’t want to go to bed.” Sigh. 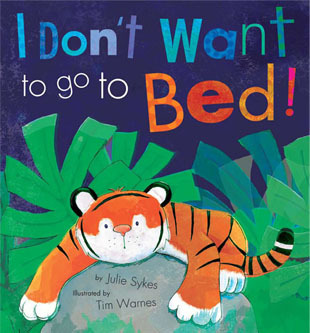 Each night when Mommy Tiger tells Little Tiger it’s bedtime, he says he doesn’t want to go to bed. So, one night she grants his wish by telling him he can stay up all night. I Don’t Want to go to Bed! is adorable. A perfect blend of a sweet story and colorful illustrations, every little one who tries to avoid bedtime–and even those who haven’t–will enjoy following along Little Tiger’s journey through the jungle as he dashes from one animal family to another trying to be sure he can stay up all night. Little Tiger is the main character featured in other books by Sykes. I’m definitely interested in reading the others. I received a copy of this book from the publisher. This review contains my honest opinions, which I have not been compensated for in any way. This book sounds delightful and I like the cover too!